Vision and Tri-Shade blinds These blinds are a cross between a roller blind and a venetian blind. They are made of fabric, just like roller blinds, but allow you the flexibility to control light like a venetian blind can offer you. It’s the best of both worlds. The most popular variant of this blind type is the vision blind. Essentially it is two pieces of cloth with horizontal lines of solid and voile fabric which as they pass each other form different shading. This gives you a greater ability to control shading whilst still controlling privacy. 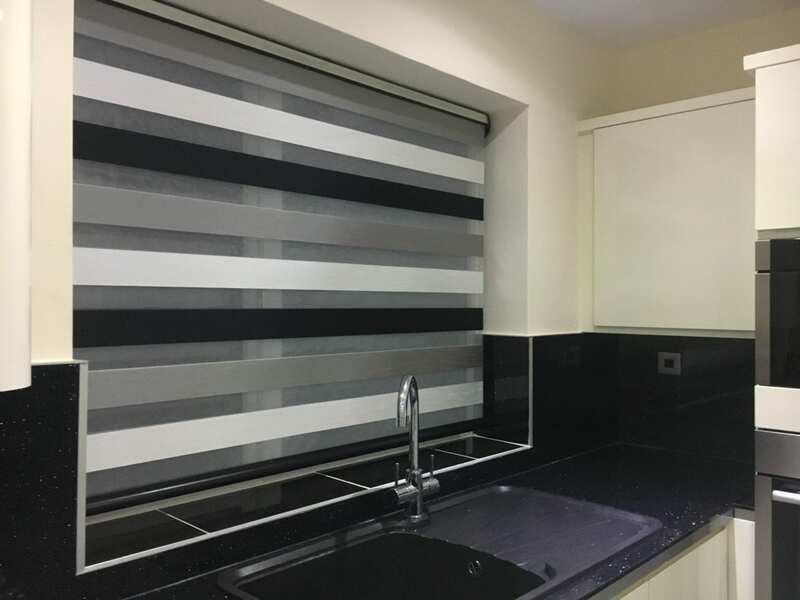 Each blind comes with a headbox and your choice of fabric can be inserted into the headbox which completes the neat and uncomplicated look of the blind. The motorised options using the ‘One Touch’ system are particularly interesting giving you the option of controlling five blinds from a single remote control. Tri-Shade blinds have a similar principle with the light shading variation only possible when the blind is fully down. Control options are a manually operated chain located at the side of the blind or motorisation is possible using the ‘One touch’ system.